Find answers in our FAQ page. The success of your high-content screening (HCS) and high content analysis (HCA) assays will always be dependent on high-quality, reproducible reagents. 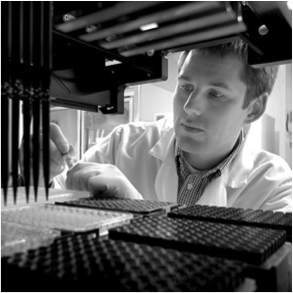 CST scientists use HCA in-house to develop and validate our antibodies for use in immunofluorescence applications. This means you can use them with confidence in your screening assays, save valuable time and resources, and increase efficiency in your discovery pipeline. CST also offers lot reservation, large bulk ordering, and custom formulations, ensuring consistent reagent performance through your entire HCS/HCA experiment. Any of CST’s antibodies validated for immunofluorescence (IF) may be used in a high content screen. Our catalog of IF-approved antibodies is constantly expanding and includes both post-translational modification (PTM)-specific and total antibodies against targets in many disease-related signaling pathways. Whether your HCS/HCA endpoint requires measuring target expression, subcellular localization or PTM / activation state, CST antibodies enable quantitative endpoint analysis for drug screening and disease modeling studies. 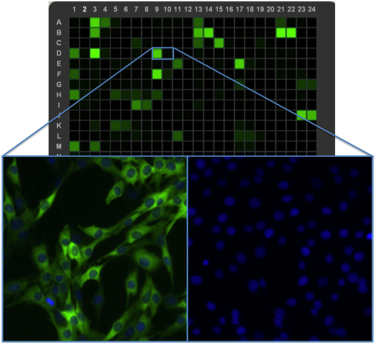 High throughput laser cytometry (heatmap, top) in combination with high content imaging (bottom), are critical tools for all development and production testing of IF-approved antibodies at CST. CST scientists use HCA for in-house antibody validation.